Luke Holman is currently in South Africa on an exchange program with the South African Environmental Observation Network and Nelson Mandela University. He is supervised in country by Dr. Shirley Parker-Nance, a benthic ecologist and taxonomist with an in-depth knowledge of South African ascidian species. 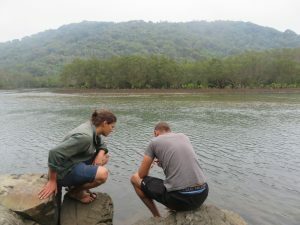 As a part of the exchange he is conducting a coast-to-coast field trip to assess the change in non-native ascidian biodiversity over the last decade using both traditional and eDNA survey techniques. Luke (left) and Thomas (right) surveying the oysters from the mangroves near Port St John. He is joined by PhD student Molly Czachur and field specialist Dr. Thomas Grevesse from Prof. Sophie von der Heyden’s Lab, who are interested in using environmental DNA to explore broad scale spatial fish biodiversity. 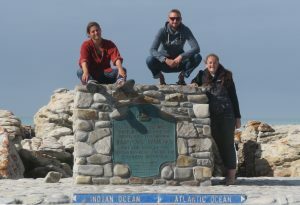 Luke (left), Thomas (centre) and Molly (right) at Cape Agulhas near to the meeting point of the Indian and Atlantic Oceans.